On Tuesday, Secretary of the Interior Ryan Zinke appeared before the Senate Energy and Natural Resources Committee to defend the Trump administration budget proposal for the Department of the Interior. From start to finish, Secretary Zinke played fast and loose with the facts. “I never took a private jet anywhere,” Zinke said in response to a question from Sen. Maria Cantwell (D-WA) about whether his use of taxpayer funds to take a private plane from Nevada to Montana was a mistake. In fact, Zinke did take a private plane—which was owned by an oil and gas executive—at a cost of $12,000 to taxpayers. Later, in response to a question from Sen. Ron Wyden (D-OR), Zinke denied that he has rolled back protections for national public lands: “I challenge you to give me one square inch of land that has been removed from federal protection.” In fact, Secretary Zinke eliminated protections for 2 million acres of public lands in Utah—the largest rollback of federal land protection in U.S. history—when he oversaw the dramatic reductions of Bears Ears and Grand Staircase-Escalante national monuments late last year. However, the most outrageous claim of all was Zinke’s description of his proposal to address the National Park Service maintenance backlog with new revenues from mining and drilling in America’s public lands and coastal waters. “This is the largest investment in public lands infrastructure in our nation’s history,” he proudly repeated throughout the hearing. Not only is Zinke’s statement patently false, but it also serves as an attempt to distract from the myriad ways his budget proposal severely undermines investments in and protections for America’s last wild places. Next Tuesday, a bill to codify the Zinke proposal will get a hearing in the House Natural Resources Committee and a companion bill has already been introduced in the Senate. But Congress should think twice before giving Zinke a blank check to drill on public lands and waters under the guise of supporting national parks. This column outlines three ways that Zinke’s proposal—and his characterization of it—is both misleading and irresponsible. In response to the Great Depression, President Franklin Roosevelt’s Civilian Conservation Corps employed more than 3 million Americans in restoring, protecting, and creating infrastructure for our parks, forests, and public lands. This investment—$58 billion in 2018 dollars—dwarfs Zinke’s proposal to provide “up to $18 billion” in funding. A brief history lesson proves that Zinke’s superlative claim simply doesn’t pass the Pinocchio test—not by a long shot. The president’s budget proposes a drastic 16 percent cut to the Department of the Interior. The proposed 7 percent cut to the National Park Service would result in extreme staffing cuts of nearly 2,000 park rangers. The Fish and Wildlife Service and Bureau of Land Management would see similar cuts to their land management and staff budgets. Importantly, the budget nearly zeroes-out the Land and Water Conservation Fund (LWCF), the bipartisan and highly successful program that has authorized nearly $50 billion to be spent on public lands and waters over the past five decades. Zinke’s claim that he’s investing in national parks while he’s simultaneously kneecapping existing programs and funding for public lands is disingenuous at best. His budgetary approach is akin to purposely wrecking a car and then offering to pay for its oil change. Zinke’s proposal is wholly insufficient and reveals a lack of understanding—or willful disregard—for the real need for comprehensive investments in all public lands. In order for Zinke’s $18 billion in funding to materialize, the Interior Department would need to sell out sensitive wildlife habitat—like the Arctic National Wildlife Refuge—to oil companies, open up national monuments to mining and drilling, and expand drilling off the nation’s coasts. Not only are these actions wildly unpopular with the American public, but many are legally questionable and will inevitably end up mired in court battles. Furthermore, the proposal assumes a price for oil more than two times what it is today. In other words, Zinke’s mythical $18 billion fix relies on fuzzy math, a disconnect from reality, and a willingness to sacrifice America’s last wild places. 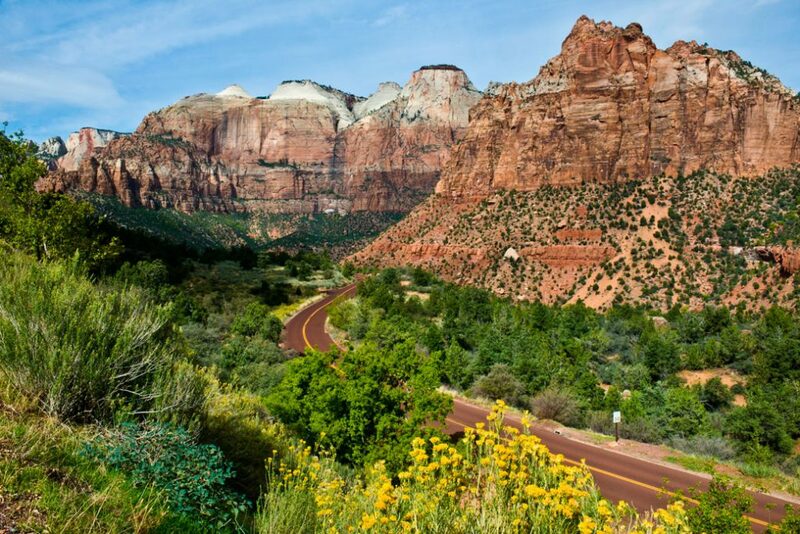 Visitors to Zion National Park won’t be too pleased with the fresh asphalt on the park’s roads if it means staring at oil rigs next door. If Zinke were serious about supporting parks and public lands, he would throw his support behind Sen. Chuck Schumer’s (D-NY) realistic, comprehensive, and effective proposal to invest $15 billion in the protection and maintenance of America’s public lands. Schumer’s proposal permanently authorizes and funds the LWCF to provide more opportunities for future generations to hike, fish, and explore the great outdoors. It also provides critical investments not only in our parks, but in our wildlife refuges, forests, and other public lands and areas for outdoor recreation across the country. After proposing massive budget cuts to the national parks, Zinke’s proposal tries to use national park maintenance needs as an excuse to push for offshore drilling near our Atlantic and Pacific coasts, eliminate national monuments, and open up the Arctic National Wildlife Refuge to the oil and gas industry. A quick fact check, a review of the true funding needs for public lands, and an examination of his underlying motivation reveal that Zinke entirely misrepresented his proposal during the hearing. A more accurate superlative for Zinke’s proposal is: the largest sham for public lands infrastructure in U.S. history. Nicole Gentile is the deputy director for Public Lands at American Progress. Jenny Rowland is a senior policy analyst for Public Lands at the Center. The authors would like to thank Kate Kelly, Matt Lee-Ashley, and Emily Haynes for their work on this column.